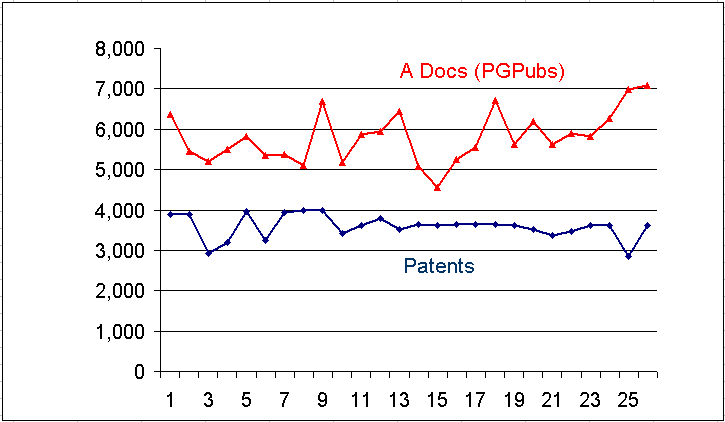 Published patent applications (A docs) surged in Q2, setting two new records for weekly and quarterly totals. On June 28, the USPTO published 7,082 A docs, an all-time high. The average number of A docs per week in Q2 was 5,895. The total number of A docs for the quarter was 76,640, a 4.1 percent increase over the same period in 2006. The total number for January through June was 150,917. At this rate, the total number of A docs published in 2007 could easily exceed 300,000, which is still significantly short of the 450,000-475,000 new applications the USPTO will receive this year. It is almost certain that new records will be set in the second half of the year and into 2008. Patent issues (utility, design, reissue and plant) remained flat in Q2, averaging only 3,525 patents per week. The total number of patents issued in Q2 was 45,828, a 16.3 percent decline from the same period in 2006. The total number of patents issued from January through June was 93,160. At this rate, the USPTO will issue approximately 186,000 patents in 2007, a decline of about 5.4 percent over 2006. The graph above shows the “peaks and canyons” phenomena that has been so typical of U.S. patent counts over the past year. The “peaks” are spikes in the number of published A docs, gradually increasing in frequency and size over the past six months. Patent issues, on the other hand, are relatively stable from week to week with an occassional drop off that produces a “canyon” in the otherwise flat profile. Changes are afoot at the USPTO that could in the near future impact the output of A docs and issued patents. The USPTO has introduced rules that would limit the number of continuing applications an applicant could file. Since, according to the USPTO, up to one third of all new applications are continuations, this could lead to a decline in the number of new filings. Which is exactly what the USPTO is expecting (and praying for). Statistics are compiled from the USPTO patent (PatFT) and published application (AppFT) databases.